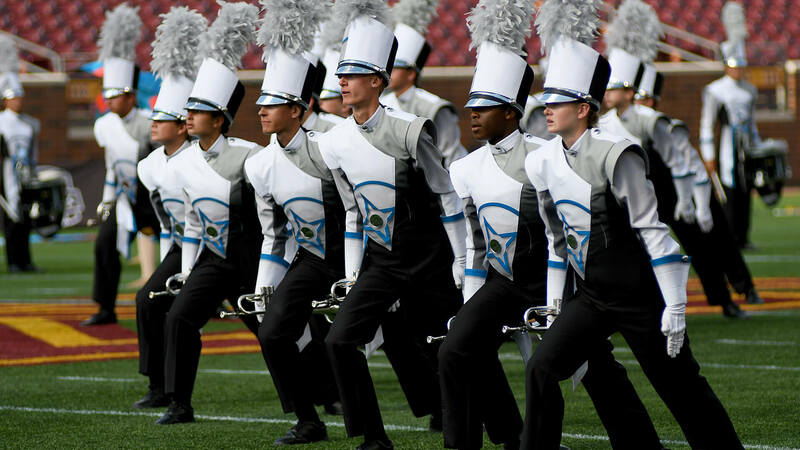 On Saturday, July 8, 10 World Class corps and four Open Class corps competed at the DCI Minnesota presented by the U.S. Marine Drum & Bugle Corps competition at TCF Bank Stadium in Minneapolis. The competitive ground of the DCI universe shook when Santa Clara Vanguard topped the Bluecoats for the first time since 2014. In reading the following, keep in mind that the scores of the two general effect captions are counted for full value, without being averaged. However, each of the scores of the three visual and three music captions are first divided in half, with each of those half scores added for the total visual and total music scores. Two percussion judges were utilized for this event. View the complete recap of World Class scores for this event. View the complete recap of Open Class scores for this event. Santa Clara Vanguard (1st – 80.200) won the General Effect 1 sub-caption by 0.30, but lost General Effect 2 by 0.20, to score 0.10 under Bluecoats in total General Effect. While winning Visual Proficiency by 0.20, Vanguard fell to Bluecoats in Visual Analysis by 0.30, but took Color Guard from Bluecoats by 0.20, winning Total Visual by 0.05. SCV took 2nd to Bluecoats in Brass by 0.20, but took Music Analysis by 0.20 and Percussion by 0.30, for an advantage in total Music over Bluecoats of 0.30, which was the bulk of the difference in the overall score advantage of a tenth of a point. Bluecoats (2nd – 80.100) placed no lower than 2nd in any caption or sub-caption. High marks were first-place finishes in overall General Effect, as well as the Visual Analysis and Brass captions. Phantom Regiment (3rd – 74.900) placed 3rd in both General Effect sub-captions, Visual Proficiency and Visual Analysis, Music Analysis, and Percussion. The corps took 4th in Color Guard, Brass, and Music Analysis. Overall, Regiment bested the Blue Stars by a hefty 0.90 in total General Effect, 0.55 in total Visual, and 0.075 in total Music, adding up to the 1.525 total advantage over Blue Stars. Blue Stars (4th – 73.375) placed 3rd in Color Guard, Brass, and Music Analysis, 4th in Percussion, 5th in total General Effect, and 5th in Visual Proficiency and Visual Analysis. Crossmen (5th – 72.850) took 4th in total General Effect, Visual Proficiency and Visual Analysis, and 5th in Color Guard and all three Music captions. Madison Scouts (6th – 70.775) placed 6th in total General Effect and all three Visual captions, 7th in Brass and Music Analysis, and 8th in Percussion. The Academy (7th – 68.750) took 6th in Music Analysis, 8th in Visual Analysis and Percussion, and 7th in everything else. Troopers (8th – 67.400) finished 6th in Brass, 7th in Visual Analysis and Percussion, and 8th in all other captions. Genesis (9th – 60.225) place 9th in all captions. Pioneer (10th – 52.225) placed 10th in all captions. Legends (1st – 57.675) placed 1st in all captions. River City Rhythm (2nd – 51.925) took 2nd in all captions except for a 3rd-place finish in Color Guard. Colt Cadets (3rd – 47.575) took 2nd in Color Guard, 3rd in total General Effect, Visual Proficiency, and Visual Analysis, and 4th in all three Music captions. Shadow (4th – 45.900) placed 3rd in all three Music Captions and 4th in all other captions.